Histones are proteins essential for the packing of DNA into nucleosomes and the formation of chromatin in eukaryotes. Nucleosomes are formed from the wrapping of ~146 base pairs of DNA around a histone octamer (which itself is formed from two pairs each of H2A, H2B, H3, and H4 histones). The wrapped nucleosomes are then further compacted using a linker histone, H1. Histones have a mostly globular structure with an amino terminus, which shows greater flexibility, called the tail. The tail of a histone sticks out from the surface of nucleosomes and can be covalently modified via processes such as phosphorylation, methylation, biotinylation, ubiquitination, and poly(ADP-ribosylation). Post-translation modification impacts chromatin structure for processes such as DNA repair, gene regulation, and chromosome condensation. 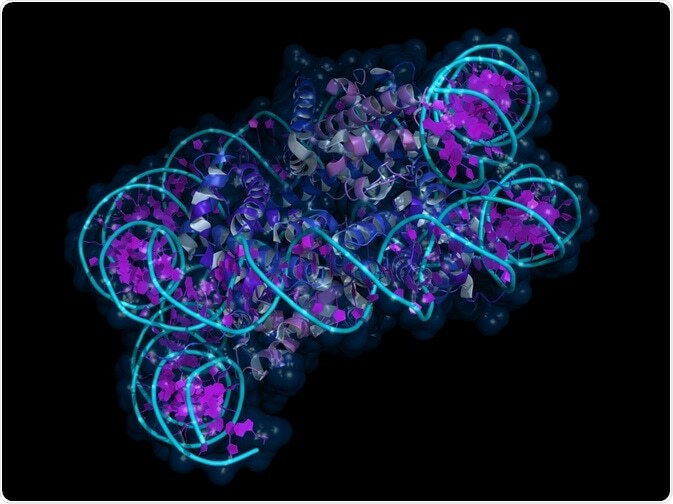 As chromatin research has gained prominence, Abcam has produced a range of histones and associated antibodies, including antibodies that recognize either core histones or covalently modified versions. This includes histones modified by biotinylation, lysine acetylation, mono-, di- or tri-methylation; arginine mono- or di-methylation; arginine substitution with citrulline, and serine or threonine phosphorylation. The Abcam range of histone antibodies also includes antibodies designed to target histone modifying enzymes. Abcam’s chromatin-targeting antibodies have been tested by western blot analysis and ELISA using peptide blocking methods. Additionally, many have been tested using chromatin immunoprecipitation (ChIP), having been assigned ChIP grade status, and also have been tested in several different species. Abcam can also provide many human antibodies that recognize modified histone and enzymes which modify histone. These enzymes include phosphatases, ribosylases, methylases, methyltransferases, demethylases, kinases, acetylases, deacetylases, and deaminases. Recent research has also shown the important role variants of histone play in epigenetic processes and chromatin remodeling. In these instances, variants of histone are deposited at particular genes, silent loci, and centromeres by multi-protein complexes. Abcam can sell antibodies to target the core histones H1 (H1.4), H2A, H2B, H3.1, and H4. They can also provide antibodies designed to target modified versions of the core histones, including H1.0, H1.1, H1.2, H1.3, H1.5, H1.X, H2A.X, H2A.Z, H2A.BbD, macroH2A.2, CENP-A, and H3.3. Yeast is frequently used in histone and chromatin research due to strong histone sequence similarity between humans and their Saccharomyces cerevisiae and Schizosaccharomyces pombe homologs, in addition to yeast being easy to work with. Recent research on histone modifications on yeast, which covered the entire yeast genome, is possible because the genome has only 6000 ORFs. This research used ChIP-on-chip technology to show that patterns of methylation and histone acetylation are uniform. Abcam can provide several chromatin targeting antibodies which work in yeast including antibodies that target H2A variant Htz1, Histone 2A (phosphor S129), H3 (tri methyl K36), and histone H3 (tri methyl K79). All of these antibodies react with yeast histones in the same manner as human histones. Plants are gaining traction as model organisms for epigenetic and chromatin-based research. This is because they display more complex heterochromatin than yeast. Abcam can provide over 20 chromatin-targeting antibodies which function in the plant Arabidopsis thaliana. These include pan methyl Lysine antibody, Histone H3 antibody, Histone H3 (di+tri methyl K4), and Histone H3 (phospho S10) antibody, as well as twelve more that are designed for use in sequence homology. Following the discovery of Polycomb proteins in Drosophilia, many other protein orthologs have been found which help maintain higher order DNA structures. For this reason, Drosophilia has become a model organism for research into chromatin structure and function. Abcam can provide over 50 chromatin targeting antibodies for Drosophilia research. The antibodies Histone H2B (di methyl K43), Histone H3 (acetyl K9) [AH3-120], Histone H3 (di methyl K27) are all predicted to react with the Drosophila melanogaster histone based on sequence homology with the human histone sequences. Histone research is highly important and takes place in large quantities, meaning when research is ChIP-based it is important there are no variations between batches.